Our radiator is truly a performance radiator, not an adaptation of an OEM radiator. In most cases it is a direct fit replacement that is made to fit your vehicle. 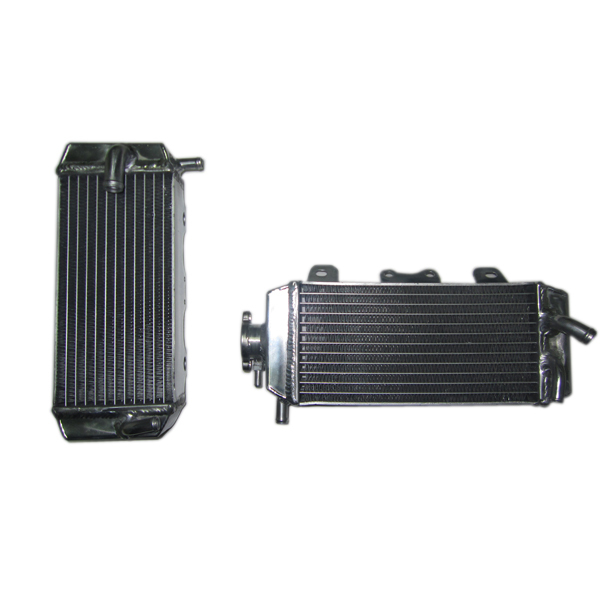 If your car came with a crossflow radiator, we make it in a crossflow. If your car came with a downflow (top & bottom tanks) we make it that way and it fits. We are a true manufacturer of performance aluminum radiators. Some other companies purchase their cores from a core manufacturer and put on their own tanks. They are often limited in core design and dimensions to whatever they can purchase. We manufacture our own tubes, fins, headers, side channels and tanks. By controlling every step of the manufacturing process for each component we can produce a radiator that is designed from drawing board to finished product to fit your exact application. Then why have aluminum performance radiators become so popular? One big reason is that the OEMs saw the potential for a significant weight reduction and lower material costs. Racers are also big on aluminum performance radiators for that reason, with a weight difference of around 10 to 15 pounds. Plus, aluminum radiators start with 1-inch cooling tubes roughly 31/48 inch apart. Fin counts are also a critical radiator-design component, but a higher fin density (measured in fins per inch) may make airflow more difficult and not necessarily work well for street applications. The two major designs for radiators are vertical flow and horizontal flow. As far as efficiency is concerned, there is no advantage to horizontal-flow radiators other than that they tend to allow a larger core to fit into a given engine compartment. Virtually all production-based radiators are built with a single-pass design, where coolant enters from the engine into the top of the radiator and travels across the core to the outlet on the opposite side. While dual-pass radiators have been around for a long time, they are now beginning to show up in high-performance and racing applications. A dual-pass horizontal-flow radiator moves coolant across the top half of the radiator on the first pass, then directs the coolant across the lower portion of the radiator face for a second pass. One reason this works is because the velocity of the coolant roughly doubles when the coolant is forced to travel across half as many tubes per pass. This creates turbulence in the tubes, exposing more coolant to the radiator tube walls and improving heat transfer. This also presents an increased load to the water pump, which means using a dual-pass radiator demands a better water pump if the system is to take advantage of the dual-pass concept.